New version 1.2.8 of Voice4u for iOS (iPhone/iPad/iPod touch) is out now! At last the preference of the application can be controlled through the “Settings” app of the iOS. 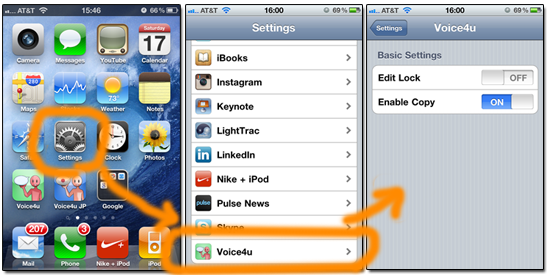 To do so, 1) tap “Settings”, 2) scroll down the screen (almost) all the way down, 3) find “Voice4u” and tap it. You can also control the preference from the application itself. We are working on the new version of Voice4u, version-2. It finally takes advantage of the rich real estate of iPad and comes with a lot of new nice features: (1) multiple icons on a single screen, (2) re-ordering icons by gesture (without manipulating the title of an icon), (3) hide icons instead of permanently deleting them, (4) ability to crop the image when adding a new icon, (5) selecting images from Google Image Search, (6) support both horizontal and vertical screens, (7) favorite items, and lots more! Technically, the new version (version-2.0) is “a Universal app”. A Universal app is essentially an iPhone app and an iPad app built as a single app. If you already own Voice4u, you don’t have to repurchase the app to install onto the iPad. The new app automatically detects the type of device and select a system for you.